Are you interested in exciting new diving locations? Why not try the flooded cellars of one of the biggest breweries in Budapest? The so-called “Kőbánya” area was previously a limestone mine used for the construction of the Parliament, the Castle and also for the Citadella. Later, when it was partially flooded, the place was converted into the “Kőbánya” brewery. The water in the flooded mine was so clear that they used it to produce beer. The cellars of the brewery are not used anymore, so the place became a unique diving attraction that is well worth visiting. Here is your opportunity to try scuba diving in the beautiful Kőbánya system! Discovering Kőbánya for beginners and for advanced divers. Diving in Kőbánya is recommended both for beginner and advanced divers as the main halls of the mine are open-air therefore they qualify as open water diving. As a beginner you can dive with us in the top areas which is already a special experience. As we go further down (only with advanced divers), keeping all the rules of cave diving in mind we venture in certain smaller areas. The average dive time is 40 mins. After arriving to Kőbánya (we can help you arrange your trip there) you will get to listen to a short presentation about the mine by the local guide. After this we ride by car into the mine. (Please bring warm clothes, average temperature is 8˚C.) We’ll park near the diving location, and go on a short sightseeing before getting ready for the dive. After a few instructions we get ready and checked by a cave diving instructior and start diving in the main hall. First we’ll get to observe the industrial objects left behind in the main hall. One by one we swim into the smaller halls with our flashlights. Advanced divers can venture forward into deeper areas. After the dive we keep a security stop at 5 meters. As the temperature of the water is 13˚C it is recommended to have a thick neoprene suit on or a dry suit (only if you are experienced diving in dry suit). You should wear gloves and cape as well! We can help you renting all the gears needed for the dive.Technical divers, wreck divers or cave divers can go further! 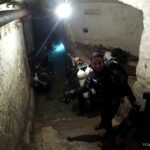 What is necessary for the Kőbánya dive? You should have at least an OWD qualification (beginner level) or AOWD (advanced level). You should have a medical certificate that is not older than 1 year. Sign up by email or by phone for the dive. Dives start with min. 3 people. How much does the Kőbánya dive cost? Contact us and reserve your place on our next dive! Contact us if you would like to sign up or if you have any questions: by phone: +36705740445, or by mail: [mailto]info@tbkdivers.com[/mailto] .